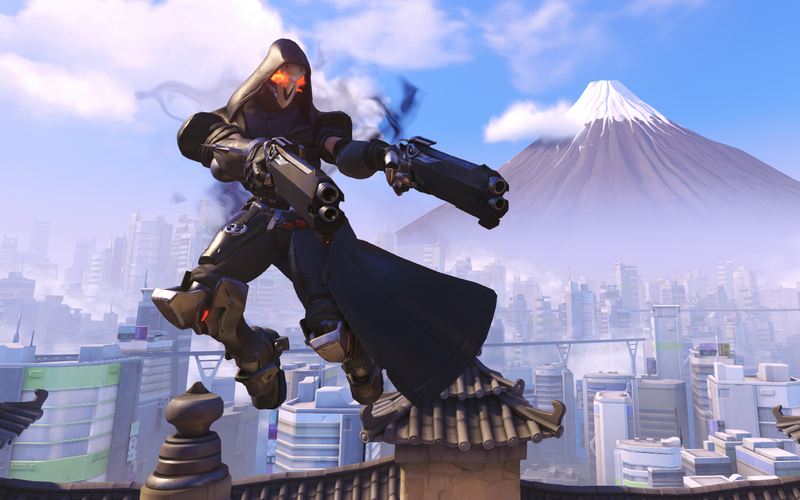 Reaper was one of the first characters shown by Blizzard in the initial Overwatch animated short. Since then, cool and edgy players have flocked to the shadow assassin to deal out damage. But before you go in game and creep around, find out the best way the to play Reaper. Reapers main source of damage are his Hellfire Shotguns. Beside his ultimate, Reaper’s only damaging ability is his primary fire. The shotguns are similar to any other shotgun: They pack a lot of damage up close but are not good at range. 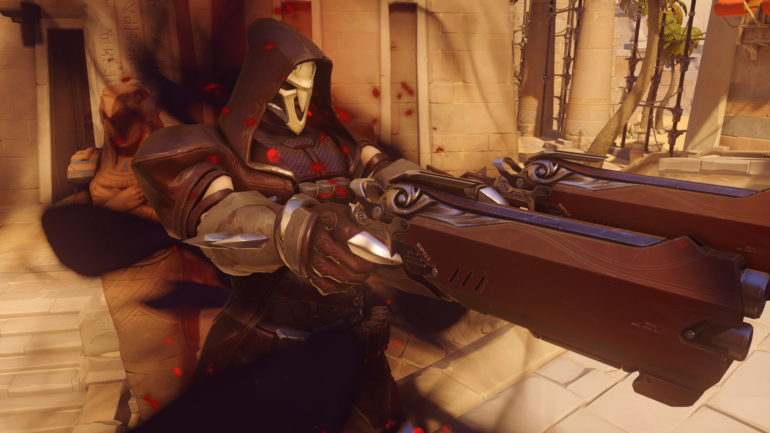 Reaper has eights shots split evenly between his two shotguns. All of Reaper’s ways of dealing damage, the ultimate, primary fire, and melee, received a significant buff in a balance change that gave him lifesteal and those abilities. With any damage that Reaper deals, he heals for 20 percent of that damage. This allows him to stay in fights longer while keeping his health total higher even without a healer. When in danger, always try to hit back at your enemy as it may keep you alive long enough to either run away or kill them. The best way to win with Reaper is to maintain the element of surprise. Stay in the shadows until you find the perfect time to strike. To properly use the power of the Hellfire Shotguns, Reaper needs to get up close and personal with his targets. He can get into position to do good damage with Shadow Step. Reaper picks a target location that’s a maximum of 35 meters away from him, then teleports to it. You must choose your location carefully because wherever you are teleporting is visible to the enemy team, leaving you briefly vulnerable. If you find yourself in trouble after using Shadow Step or during the run of play, Reaper has a convenient way to get out of danger. Wraith Form makes Reaper invulnerable for up to three seconds. Using this will allow you to run away from danger without the enemy able to attack you. After the recent balance change to Wraith Form, you are now able to cancel the ability whenever you need to. This allows for wider use of the ability, since you are able to use it to get out of danger and run far away, or just to avoid quick burst damage and come back quickly to deal damage back. The change also increased the movement speed of the ability so that you can get further away. Another useful way to use Wraith Form is to stall out a point. Since Wraith Form makes you invulnerable, it is a handy tool to stall time on the point for the rest of your team to arrive, whether on attack or defense. Reaper’s ultimate is Death Blossom. Using this, he fires his Hellfire Shotguns in an eight-meter bubble around him. This ultimate lasts for three seconds and can completely wipe out an enemy team that is close together. An effective use of reaper’s ultimate can require all of his abilities to set it up. Use Shadow Step to position yourself so that you can surprise the enemy team, use Wraith Form either to get up-close and personal or to escape after using Death Blossom, and finally use your Hellfire Shotguns to finish off any low-health targets. 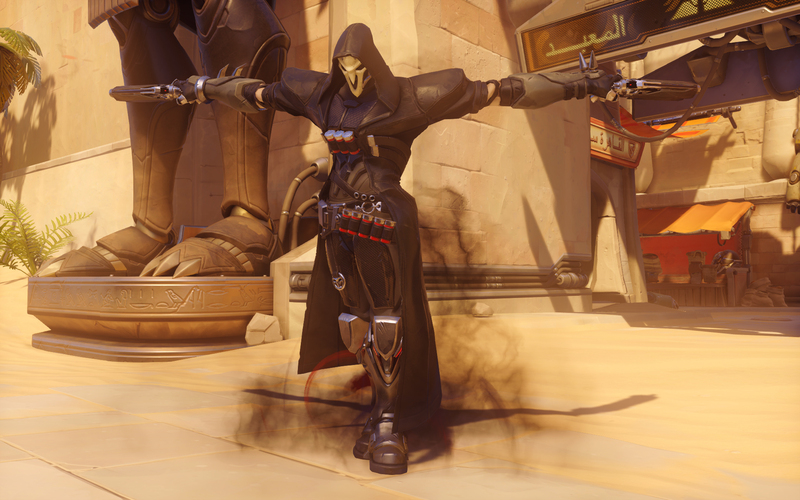 Reaper does his best work slinking around in the shadows. As Reaper, you are getting the most out of the hero when your enemy does not see you until it is too late. Reaper can work around the map to get to the back-line and burst them down to break-up the enemy team or take down the main tank to open up an engage for your team. A Nano-Boosted Death Blossom can be a devastating thing where no enemy is safe. This combination previously defined the “Beyblade” meta, and despite the nerfs, it remains a strong play to win a team-fight. Since Reaper works best when he is right next to his opponent, Lucio provides a way to get in close. Lucio can speed boost Reaper into the enemy team so that he can put out maximum damage. From the very first Overwatch animated short, it was clear that the rivalry between Reaper and Winston went deep. Though they are shown constantly fighting in the shorts, in the actual game Reaper holds the advantage. Due to Winston’s large hit-box, Reaper is able to land multiple pellets from each fire of his Hellfire Shotguns. Reaper quickly tears through Winston’s high health when fighting up close. Though D.Va is a tank with a big hit-box, her Defense Matrix can completely negate your entire ultimate. If she is near when your start your ultimate, she can use her Defense Matrix to block that damage and leave you in the middle of their team without having done much damage.